00:00 – Intro, Bruce Rainnie greets and welcomes Marie McNeil Bowness (MB) to the program. 01:00 – MB is the daughter of Dugger McNeil, mom and sister got MB into skating. She definitely loved it and enjoyed it for years, starting at age 3. 01:50 – Enjoyed the speed and creative, artistic aspects of ice dancing. Found it fun even as the sport got progressively more intense as she became competitive. 02:45 – Recognized her own strength in competition when MB broke through and competed nationally. 03:30 – Met Rob McCall through being in the same club – coaches asked them to do a dance together, and agreed to compete in couples ice dance without knowing what it really was. They used to be friends only socially but got much closer as time went on. 05:30 – RM was definitely “the character” on the ice with artistic flair and competitiveness and skating ability. 06:30 – The team advanced rapidly, competing and medaling each year. 07:20 – Chemistry based on their similar backgrounds and developing together. They became close friends as well. It takes 4 years to develop chemistry in a dance team, and they had had 8 years together. It is tough to succeed without chemistry and friendship, and MB believes that you have to have respect and a balanced pair as well. 10:30 In senior, they were ranked bronze, bronze and silver, and achieved gold in 1981, a championship that took place in Halifax. They were driven by wanting gold, and by impressing their home community. MB is proud that she skated her heart out, and keeps her win as a warm feeling and treasured memory. 11:45 – MB trained herself against nerves – gaining experience to face pressure, and addressing the needs of her partner. 12:45 – In the championship they prepared for high expectations by their community, family, and media. 13:45 – Stepped back from skating after world championships, where they placed second but still didn’t qualify for the Olympics. Did one more year of skating, but decided to move on and let Rob McCall find a new skating partner. 15:10 – Reasons for not qualifying for Olympics were unclear – MB was told both that it was the cost and they had a low expectation of medaling or placing top 10, but never got a clear, full explanation. 16:00 – First year watching Rob McCall and Tracy was weird, but she supported her ex-partner and was proud of his success. 16:45 – RM was the full package as a skater. 17:50 – Wanted to move on after athletics and do other things, especially because at that time there was little direction to go with pro skating: either coaching or ice capades. 19:30 – Ready to explore other options with family business; sales and marketing world. MB started to teach power skating and ice dance. Post Salt Lake City scandal, MB worked to clean up the ice dancing world and put a new judging system in place that, while not foolproof, is much better than it used to be. 22:15 – Development in the sport puts figure skating in a good place in the world today. 22:30 – MB believes that Virtue and Moir are the best ice dancers they’d ever seen. 22:45 – Kurt Browning also an immense talent with big personality. 23:30 – A culture change is needed in atlantic Canada in order to produce more high-quality skaters – more togetherness in the skating community. 25:50 – Bruce Rainnie concludes the program, end of recording. Description: One digital .mp4 video file, colour, with audio. 25 minutes and 49 seconds of footage, 1.8gb in size. 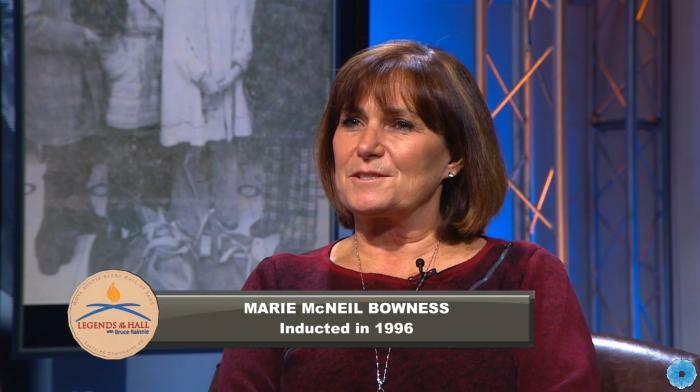 Host Bruce Rainnie interviews Marie McNeil Bowness for the Legends of the Hall television program on Eastlink TV.